I was looking for decorative paintings at a seasonal flea market in Sonoma County when I found this desert painting by Freda Marshall. I thought that I would be able to resell it for my monthly “nut”, the amount of money I needed to not dip into my savings. I’m a busted-up retired construction worker with a marginal SS supplement, and I try to augment that income with wheeling and dealing “cheap” art by unknown painters. 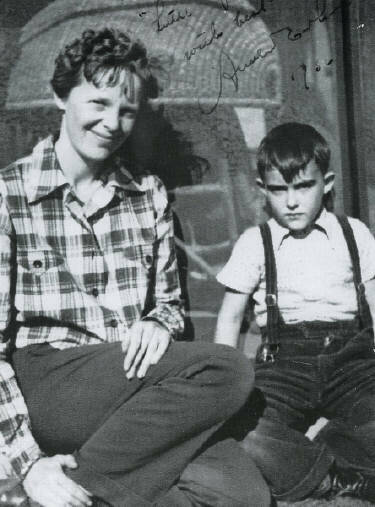 I’m telling you all of this so that you can understand why I spent so much time trying to find out about Freda, who she was and why she wasn’t “known”. The painting was $40 and I was happy with the purchase even when I was told that the artist wasn’t “listed”. A local expert—also shopping for deals that day—waffled on the purchase because “Freda Marshall” did not exist in any of the on-line art reference sites. His doubt was my gain. Even if I only resold it as a decorative piece, it had the right look for where I sold my “stuff”. But I was sure Freda would be listed somewhere as the painting just seemed too good not to be by “someone”. The local pro fussed about it, and hesitated too long. Other buyers passed by and it was left for me. I spent some time researching that week and only found one reference to Freda in a publication by the Coachella Valley History Museum in Indio, and another painting of hers for sale somewhere in the Northwest at a “gallery”. It’s hard to know if galleries are real physical entities or online stores, but the accompanying picture looked similar to my painting, with a similar period frame, and they were asking $1,000. That was good news as I wasn’t the only one thinking this was a “good” painting. 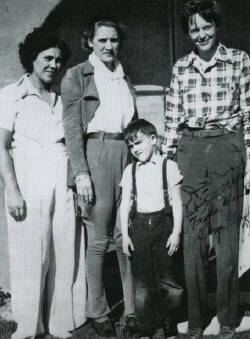 Freda Marshall, Jacqueline Cochran, George Marshall and Amelia Earhart. Photos Courtesy of the Coachella Valley Historical Society. The article in the Historical Society journal was informative but it was mostly about Jacqueline Cochran, the aviatrix who was friends with Amelia, chummy with the rich and famous, and who was building a ranch in Indio. Freda Marshall lived on Cochran’s ranch, and was pictured with Cochran and Earhart. 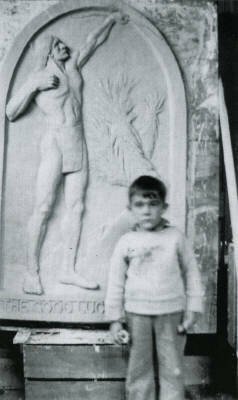 A photo showed a bas relief she was doing for the ranch, with her son standing by the piece to give it perspective. George Marshall, shown with the same son in a pool, was credited with developing the ranch. No paintings were shown. Freda was referred to as “the famous painter” and there wasn’t much else. It looked like a good fit for the Freda of my painting. I was pretty sure they were the same, but, but…there wasn’t anything else. George Marshall with bas relief by his mother. “Marshall” is a fairly common name and search as I did, not much came up on the net that looked like Freda. The painting sat on a shelf looking at me for six months and still I didn’t take it to my monthly show. I thought I could get a couple hundred for it and I could have used the money. Something kept me from selling it. If I hung onto every painting that I thought was that good, I’d never sell anything. In my business a painting without references is decorative and you get what you can for it. I thought hard about this painting and was coming to grips with either keeping it for myself or selling. My house is cluttered enough….but good desert “impressionistic” paintings are not that common so the painting was a problem for a professional procrastinator like me. There was not going to be an easy solution. But then I heard that my cousin was close to losing his battle with cancer and I wanted to see him before he passed away. He happened to live near Indio, where Freda had lived. I rented a car and spent a couple of days with my cousin and we got to laughing about all the stuff he had done, the close calls, the close calls that caught him, and what he had gotten, and what he had gotten away with. He went from “poor me” to seeing that there weren’t many cats that had more lives. So I went on to Indio and the Historical Society. They were going to have a special show the next day and the two sweet ladies didn’t know anything about Freda, but maybe the archivist did and she was around somewhere. I toured the buildings and the art show of amateur paintings in the adjacent building. I bought the historical journal with the Cochran article, and waited and toured a little more, and then here came the archivist who had heard of Freda, and had two paintings by her somewhere in the building. She had nothing to say about why they weren’t displayed although 200 non-historical paintings were displayed next door. The docent also said that there were two paintings held by the Palm Springs Museum. I asked if there was there some way I could view Freda’s paintings, even online. She indicated that there was no way and I had a difficult time understanding this. If the paintings were valuable, then there should be some reference to Freda Marshall as an important local painter. If the paintings were not important, they were certainly more impressive than the paintings in the show in the adjacent building. Why the reluctance to show them to me at all? So up the Valley I go to the Palm Springs Art Museum and it’s quite pleasant and completely dismissive of local painters. The museum has aspirations to be something grand and contemporary, but forgets it is a regional museum and the whole of America is entangled in the “West”. From the first colonies, everything after was some form of westerning. Some of America’s greatest artists were artists of the West, and the art movements in the Southwest and the local desert deserve serious treatment. Maybe I was short-tempered but I felt the whole place was snotty and slick, so much so that I slid out the door. Both the Palm Springs and Palm Desert Historical Societies were helpful but there was nothing that referenced Freda Marshall. I was stuck, done, toast. I was well past recouping any money from the painting, given the expenses I’d racked up. Periodically I would go looking for any on-line references. I also became more aware of how many talented “desert” painters there were, and I could see how many were forgotten. The written history of Coachella Valley painters was pretty much dominated by painters who came from elsewhere and just visited the Valley, or by galleries promoting their own painters and paintings. There wasn’t much room for true locals, like Freda. I want to stress what the reality is for historical paintings and local painters that aren’t researched and listed in some reference guide. They get pushed aside, discarded, ignored. I’m a small time retired antiques dealer who is trying to revive someone who deserves to get a revival. (Even without me eventually Freda would have been found again.) But I wasn’t getting anywhere. I couldn’t revive Freda Marshall with one painting. I was thinking of selling the painting at my next show when it dawned on me that there was one last avenue. I should have tried it before. I called information and asked for listings for anyone named “Marshall” in the area. It turned out the boy standing next to the bas relief in the historical society article was still hale and hearty, and he was willing to talk to me about his mother. I too have been researching lost desert art. I have been looking for “Wilie”. The pen name is for Wilma Hammerness. She has copyright on eight paintings. Four of them titled “Wildflowers”. Most of the copyrights were done in nineteen eighty one with the exception of San Cayetano Mt., copyright two thousand five. I have two painting done by Willie in the Anza Borrego area. It has been a voyage of discovery. I have lived in the Borrego Springs area in the past and I am rediscovering many artists and antisense that have touched the area of desert paintings. I am especially interested in the water color landscapes. Thank you for the article, and please keep us posted. I can be reached at Tunegolfandlandscapes@hotmail.com. Congrats on finding your own forgotten desert artist! I’m interested in the Borrego area artists and am doing further research, so I’ll let you know if I find out anything about “Willie”. The Borrego Art Institute is opening a new gallery on Christmas Circle next season, and they too are interested in the artists who painted the Borrego desert in the past. Please let me know if you find out more on Wilma Hammerness, or other Borrego painters. Thanks for sharing your find! 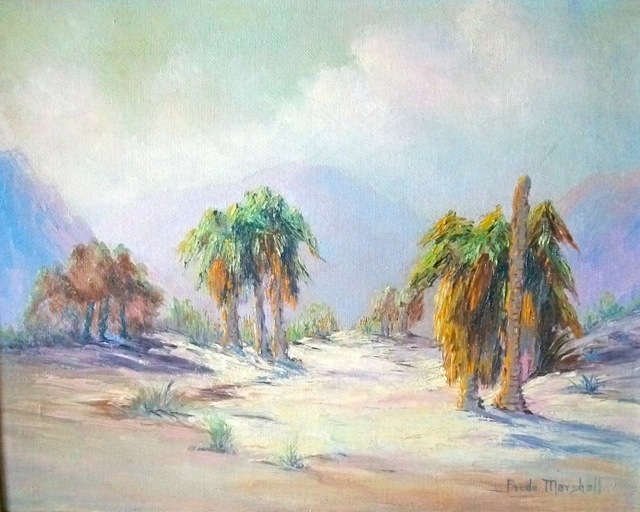 I own a Freda painting too (windblown palm trees)–it gets better the longer I have it. Let us know of your other desert painter discoveries. I’m another with a Freda Marshall original painted in 1956. My dad was a doctor specializing in arthritis. He took care of Floyd Odlam who was Jacqueline Chochran’s husband and together built the Chochran-Odlam ranch in Indio. My Dad stayed at the ranch frequently and I’m sure must have met Freda Marshall. I was on-line trying to determine if this old oil had any value. Quite an interesting bit of art history. But I still don’t as yet know of the painting’s value. Any ideas? Mr. Freyberg: I am researching (as an amateur) Jacqueline Cochran and Floyd Odlum. Have been to the Eisenhower library, read all the books, and interviewed a few people who knew them. I am interested in knowing more about your father, and if he wrote a memoir, or published anything about the Cochran-Odlum couple or his time in Indio. (I also have a peripheral interst in the whole subject of arthritis in the 50s; the physician who won the Nobel Prize for discovering cortisone was a friend of my late father’s!) I have also just had the enjoyment of seeing a photo of another Freda painting owned by an acquaintance! Anyway, if you are interested in contacting me, please feel free. Sincerely, Kristen Aliotti, kristenaliotti@cox.net and we can exchange contact information Best regards.